Smithereens: Young Crafters Unite Blog Hop!!!! Young Crafters Unite Blog Hop!!!! Hi blogland, and welcome to the Young Crafter's Unite Blog Hop! What a great reason to have a blog hop! By now, you should know a few key things. First, be sure to comment as you go on the blog hop for a chance to win some AMAZING prizes! =) Second, the theme of the hop (other than young crafters) was to use our favorite things! For this blog hop, I chose to feature two of my three favorite stamping companies. I also tried to use many of my favorite products to make these two cards. Cute cards, Kristy! Love that you made your own tree for the owls to sit in- it looks great! Also, the watermarked background is fab. The second card is adorable- love the hats on the penguins! Such a fun, happy card. Thanks for the fun eye candy!! Such cute cards! I love how you made a background with the sentiment onb the first one, and I love how you several of the penguins on the second card =) Thank you so much for joining our bloghop! I am partial to the owl card...IT ROCKS!!! Your bird card is so creative! Aw I love all those things too! And pearls make everything perfect, don't they?! :)TFS! Sweet cards! I love the party penguins! TFS! I love your post! Your cards are very beautiful, I love how you stamped the sentiment in the first card, so cute! Adorable cards! So Cute! I love your flowers that you've made with Mold Muse. Did you use clay? Can you share how you got them to be so shiny? love penguins and owls, TFS! I really like how you watermarked the sentiment in the background. What a great idea! Thanks for the tip about Queen & Co. I'll have to check them out! Love those stamps!!! Thanks for sharing. So cute both cards! I love owls! Super cute cards! Thanks for sharing the tip about the pearls! cute cards. The birthday card is really beautiful with those lovely penguins. I loved the penguins.. They are just so cute and the owl card.. I loved the sentiment.. perfect... great embellies...!! thanks for sharing - cute cards. stamps are great!! Both cards are super cute. Agreed with you on LF. They are just so versatile to use and for so many different kinds of cards. DeNami has some of the cutest images and sentiments. These cards are both so fun and cute! Great job! Very pretty cards - love your penguins! Two great cards! I just got some DeNami stamps in the mail today, they are the first DeNami stamps I have ever had so I can't wait to get them inky (even if they are thanksgiving themed) :) Thanks for the tip on the pearls, I haven't used pearls yet so it's good info to have for when I do. these are both so cute! love the fun images! those flowers you made are awesome too! super cute cards and love your roses. I love the penguin card best. I've just ordered my 1st set of Lawn Fawn stamps and it looks like others will follow! Super cute cards Kristy. The images are so sweet! I love pearls too and I just got some of the tiny resing flowers! I am in LOVE with your adorable cards and style! 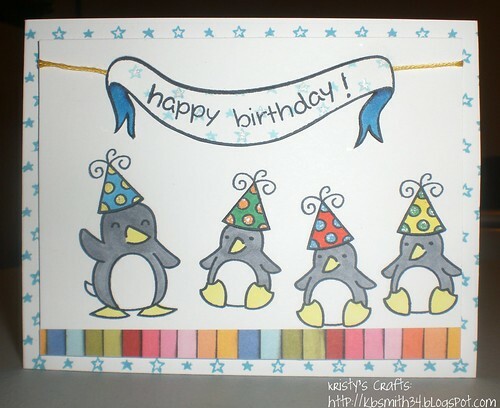 Owls are in my top faves for stamping (I am planning a card with them now) and penguins in party hats are FABULOUS. Way too cute! These are really cute and thanks so much for all the awesome tips. I'm going to have to check out the stores you recommended for sure! I'm with you ... love bling! Great job on the cards ... really fun! The owl are so cute. Like what you did with the versa mark words in the background. 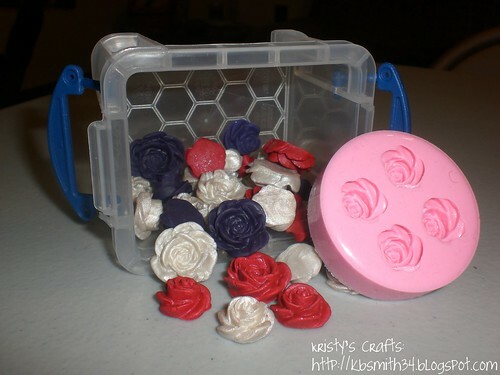 I want to try the molds too! Your owls and penguins are adorable! I didn't know about the molds, so I'll be checking on those. Thank you for the tip and sharing your cards. oh my goodness, the owls & penguins are adorable! Love your cards!! I LOVE all of your cards!! THANKS for sharing, you have a very fun style!! CUTE cards! I love those fun, sweet stamped images! I love cards with cute little animals on them, they always put a smile on someone's face. Both of these cards are so pretty! I just joined DeNami as a contributing designer and couldn't be more thrilled to be working with them. Those owls are definitely going to fall into my cart this weekend. :) They rock, and you rocked them! Thank you so much for joining us on the Young Crafters Unite blog hop! 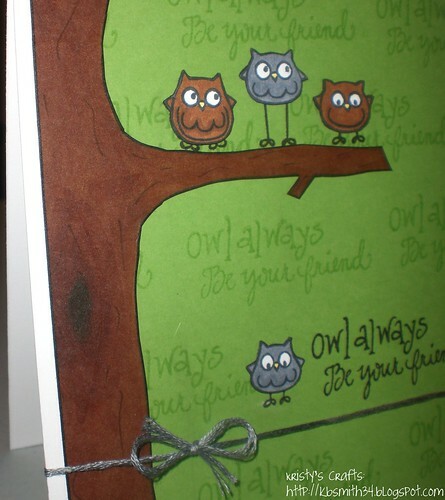 I love your owly card. Totally cute. 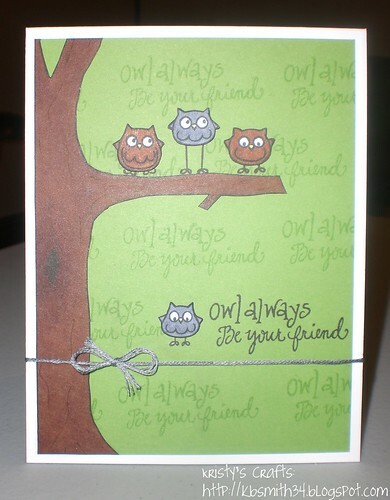 Very cute cards--I like owls too! I love owls. Very cute.